In medium bowl, combine pancake mix, cornmeal, sugar, salt and pepper; mix well. Add water; stir just until large lumps disappear. Stir in corn and zucchini. Heat nonstick griddle or large skillet to medium-high heat (375°F.). Lightly grease hot griddle. For each corn cake, pour scant 1/4 cup batter onto hot griddle, spreading batter to 4-inch diameter. Cook 1 to 3 minutes, turning when edges look cooked and bubbles begin to break on surface. Cook an additional 1 to 2 minutes or until golden brown. To serve, place 3 corn cakes on each individual plate. Top with sour cream, tomatoes and cilantro. Fresh corn kernels can be used in place of the frozen corn. One ear of corn yields 1/3 to 1/2 cup of kernels. Cook the corn on the cob, or remove corn kernels and cook them in 1/2 cup boiling water for 4 to 6 minutes, or until they are tender. Drain well. 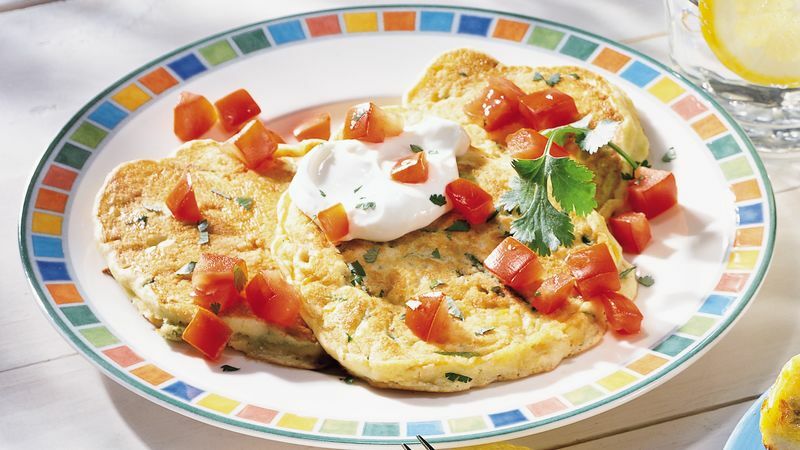 To add more spice to these corn cakes, serve them with medium to hot salsa. Serve these tasty veggie cakes with a fresh fruit salad and iced tea.